A review of Kuayue Zhong, Xin de fojiao dashi: Zhuandao fashi yanjiu 跨越中、新的佛教大师: 转道法师研究 (A Master across China and Singapore: Research on Venerable Zhuandao), by Zhang Wenxue 张文学. Despite a voluminous amount of work that has been done on Chinese Buddhism, little attention has been given to the study of Chinese Buddhism in twentieth-century China and in the Republican period (1912-1949) in particular. It was only in the last decade that scholars began to pay increasing attention and to produce English-language scholarship on this topic. Several recent dissertations contribute to the burgeoning literature and explore diverse issues, including the influence of science and scientism on Buddhism (Erik J. Hammerstrom, Indiana University, Bloomington, 2010), Buddhist activism (James Brooks Jessup, University of California, Berkeley, 2010), the reinvention of Maitreya’s cult (Justin R. Ritzinger, Harvard University, 2010), and print culture (Gregory Adam Scott, Columbia University, 2013). Zhang Wenxue’s dissertation is an important addition to this expanding scholarship and it offers fascinating insights into the translocal networks between China and Southeast Asia in the first half of the twentieth-century. This dissertation focuses on Master Zhuandao (转道, 1872-1943), an eminent yet “forgotten monk” (p. 2), to examine the emergence of Chinese Buddhism in Singapore, as well as the monk’s contributions to Buddhist reforms in China and Singapore. To recover the neglected voices of Zhuandao, Zhang draws on a wide range of materials, including temple and local gazetteers, epigraphic materials, commemorative volumes, periodicals, and archival materials, as well as interviews with prominent monastic and laypeople. His dissertation seeks to answer five questions: Who was Zhuandao? What were his religious thoughts? Why did Zhuandao, an eminent monk in China and Singapore, become neglected in both Chinese and Singapore history? How did Zhuandao influence the development of Chinese Buddhism? What implications can one draw by investigating the life and times of a diasporic Chinese monk? This first chapter introduces the subject, methods, and sources of the study. Zhang discusses the pivotal role of Zhuandao in the Buddhist reform movement in Republican China and the propagation of Buddhism in Singapore, calling him the “originator of Buddhism in Singapore” (Xingzhou fomen bizu 星洲佛门鼻祖) (p. 1). He reviews the literature on religion in overseas Chinese society, Buddhism in Singapore, and studies on Zhuandao, and contends that scholars of Chinese Buddhism often adopt a “sinocentric/East Asian centric” (pp. 20-22)approach to study the religion either in China, or in Japan and Korea. Thus, Zhang argues for the need to pay attention to studying Chinese Buddhism in Southeast Asia and in Singapore in particular. Chapter 1 also discusses the four major categories of primary sources the author relies on to write his dissertation: meeting minutes and constitutions of Buddhist organizations; oral history interviews; epigraphic materials; and commemorative volumes and periodicals in China and Singapore. Chapter 2 provides historical background on Chinese Buddhism in China and Singapore during the first half of the twentieth century. Zhang begins the chapter by highlighting the sorry state of Buddhism since the late Qing period, and the efforts to rejuvenate the religion in the Republican era. He points out the critical leadership of Taixu 太虚, Ouyang Jian 欧阳渐,and Xie Wuliang 谢无量 in the Buddhist reform movements in Republican China. Zhang then demonstrates how large-scale Chinese migration to Southeast Asia since the nineteenth century contributed to the arrival of Chinese religion in Singapore. He discusses how Chinese migrants in early twentieth-century Singapore adopted a “Buddhist” belief consisting of Buddhist, Daoist, and popular religious elements. Thus, this chapter situates Zhuandao in the broader context of reformist Buddhist movement that was taking place in China as well as the backdrop of Chinese migration to Southeast Asia. Chapter 3 offers a biographical account of Zhuandao from his childhood experiences and early encounter with Buddhism to his ordination and monastic training under various eminent monks such as Fohua 佛化 and Ximin 喜敏. It also provides an interesting background to the heyun 喝云 lineage – one of the five lineages of Linji 临济 school in Southern Fujian – with which Zhuandao was affiliated. Zhang surveys Zhuandao’s leadership positions in a number of prominent monasteries in Xiamen, including Puguang Monastery 普光寺, Nanputuo Monastery 南普陀寺 and Yangzhen Gong 养真宫, and briefly discusses the monk’s involvement in reviving Buddhism in South China. In 1913, Zhuandao went to Singapore for the first time to raise funds for Sangha College (Sengqie xueyuan 僧伽学院) in Nanputuo Monastery. In Singapore, the monk was invited to become an abbot of Thian Hock Keng (Tianfu Gong 天福宫), a prominent Mazu 妈祖 temple, where he earned a reputation for providing free medical treatment to the Chinese migrant community. The fourth and fifth chapters examine Zhuandao’s contributions to the development of Chinese Buddhism in China and Singapore. Chapter 4 discusses Zhuandao’s role as a temple builder, Dharma educator, and Buddhist scholar in Singapore. 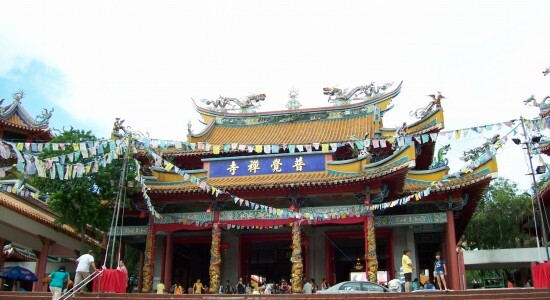 During his missionary days in Singapore, Zhuandao founded the two prominent Buddhist monasteries, namely, Singapore Phor Toh See Monastery (Xinjiapo Putuo Si 新加坡普陀寺) and Kong Meng San Phor Kark See Monastery (Guangmingshan Pujue Si 光明山普觉寺), and established three lay Buddhist associations, namely, the Chinese Buddhist Association (Zhonghua fojiao hui 中华佛教会), the Singapore Buddhist Lodge (Xinjiapo fojiao jushilin 新加坡佛教居士林), and the Buddhist Union (Fojiao hui 佛教会). These Buddhist organizations became important centers for the promotion of Buddhist teachings to the overseas Chinese community and remain influential in present-day Singapore. The monk also attempted to set up a Buddhist College (Xingzhou foxueyuan 星洲佛学院) – which was closed down for alleged communist activities – and Zhuandao Buddhist College (Zhuandao foxueyuan 转道佛学院). In addition, he started three periodicals Juehua 觉华, Juedeng 觉灯, and Fojiao yu foxue 佛教与佛学 to propagate the Dharma in Singapore. Chapter 5 focuses on Zhuandao’s involvement in the Buddhist revival movement during China’s Republican period. The monk played a crucial role in raising funds in Singapore for the restoration of Kaiyuan Monastery (Kaiyuan Si 开元寺) in Quanzhou, China. He also served as the abbot of Nanshan Monastery (Nanshan Si 南山寺) in Zhangzhou, where he founded the Nanshan Buddhist School (Nanshan fohua xuexiao 南山佛化学校). The school introduced modern subjects, including mathematics, history, geography, hygiene, and extra-curricular activities such as gymnastic, basketball, and soccer into monastic education. More importantly, Zhang highlights Zhuandao’s personal connections and networks with other prominent monks such as Xuyun 虚云, Taixu, and Yuanying 圆瑛, and his important role in connecting the Buddhist community in China and Singapore. Chapter 6 adopts a “history of ideas” approach to investigate the reformist Buddhist thoughts of Zhuandao. It begins by questioning the motivations behind Zhuandao’s involvement in the reformist Buddhist activities in Republican China: the “internal decay” of the Buddhist community, the belief of the Mahayana spirit in saving the world, and the rise of Chinese nationalism. Zhang argues that Zhuandao’s two Buddhist thoughts were “Sangha production” (Sengqie shengchan 僧伽生产) and “Buddhicize education” (Fohua jiaoyu 佛化教育) (p. 155). By “Sangha production,” Zhang refers to Zhuandao’s emphasis on encouraging monks to take up productive labor and make positive contributions to society. Zhuandao proposed that monastic could participate in agricultural and handicraft production so as not to be a “social parasite.” In addition, Zhuandao believed in promoting education to improve the quality of the Sangha and the Buddhist community in general. The chapter suggests that Zhuandao’s Buddhist thoughts had a significant impact in eradicating superstitious practices and promoting orthodox Buddhist teachings in Republican China, as well as a lasting effect on the development of Chinese Buddhism in Singapore. Chapter 7, which examines the development of Chinese Buddhism in Singapore during the “post-Zhuandao period,” is divided into four sections. The first section briefly discusses Chinese Buddhism during the Japanese occupation (1942-45) and British colonial rule between the 1940s and 60s. In the second section, Zhang highlights the role of Zhuandao’s Dharma heir, Hong Choon (Hongchuan 宏船, 1907-1990), in the reform and expansion of Kong Meng San Phor Kark See Monastery. Hong Choon’s efforts made Phor Kark See Monastery the biggest and most influential monastery in the island city-state. The third section suggests that the process of nation-building in Singapore has contributed to the emergence of what Kuah-Pearce Khun Eng calls “reformist Buddhism” since the 1970s (State, Society and Religious Engineering: Towards A Reformist Buddhism, 2nd ed. Singapore: Institute of Southeast Asian Studies, 2009). The emergence of Singaporean nationalism, as Zhang argues, has caused Chinese Buddhism to transcend ethnic and religious boundaries, promoting charity and religious harmony. The final section uses the case of a global Taiwanese Buddhist group, Fo Guang Shan 佛光山, to demonstrate the arrival of transnational Buddhist organization in Singapore. Zhang attempts to draw parallels between Fo Guang Shan’s founder, Xingyun 星云, and Zhuandao in the promotion of Chinese Buddhism abroad. He notes the many similarities between the two eminent monks’ missionary activities and religious outlook. The short concluding chapter highlights the contributions of the dissertation. Zhang asserts that his study uses Buddhism as a lens to offer new insights into the emergence of Chinese nationalism and the networks between China and the Chinese diaspora. He also suggests that a study of Zhuandao sheds new light on the study of Buddhist figures in modern China as well as the religious thoughts of the Southeast Asian Chinese community. In sum, Zhuandao was a vital human link in connecting the Buddhist community in China and the Chinese community in Singapore. With extensive use of a wide range of primary sources, combined with fieldwork conducted in China and Singapore, this dissertation makes an important contribution to studies of Chinese Buddhism, modern Chinese history, and Southeast Asian history. This study sheds important light on the translocal Buddhist networks between China and Southeast Asia, which continue to shape and influence Sino-Southeast Asian interactions, ethnic Chinese networks, and the revival of Buddhism in post-Mao China. Xiamen University. 2011. 293 pp. Dissertation originally written in Chinese. Primary Advisor: Zeng Ling. Image: Kong Meng San (Bright Hill) Phor Kark See Monastery (Pu Jue Chan Si), Singapore, May 2010. Photography by Zhang Wenxue.